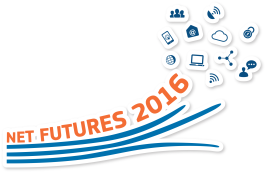 Net Futures 2016 - Driving Growth in the #DigitalSingleMarket takes place on 20-21 April in Brussels. Gathering over 1,000 participants, Net Futures will form an interconnected community of public and private organisations in research and innovation, market validation and living lab research, business development, entrepreneurship and enterprise strategy, and policy making. Keynote speeches, parallel workshops, and the interactive exhibition will highlight policy priorities and showcase the latest technologies in Europe to maximise competitiveness across the Union. The workshops focus on either Research & Innovation, Market Validation or Go-to-Market aspects.